Nephrology is a branch of medicine concerned with the kidneys, specifically with their structure, functions, or diseases. The word nephrology derives from the Greek “nephros”, meaning kidney or renal. A doctor practicing nephrology is called a nephrologists. They are also often referred to as “kidney doctors”. They generally treat chronic kidney disease (CKD), high blood pressure, acute renal failure,kidney stone and polycystic kidney disease (PKD). They are also educated in all aspects of kidney transplants and dialysis. A nephrologist performs blood and urine tests, and sometimes a kidney ultrasound, to detect any problem with the patient’s kidneys. If necessary, a nephrologist can also perform a kidney biopsy in order to better diagnose a kindey problem. A nephrologist, however, is not a surgeon, and therefore does not generally perform operations. For cases of kidney cancer, prostate operations or extraction of kidney stones, the patient is generally referred to a urologist. 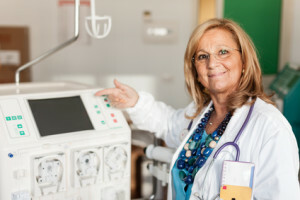 In cases of dialysis or a kidney transplant, the nephrologist discusses different types of dialysis with the patient and refers them to a transplant center. Kidney doctors usually meet with dialysis patients multiple times per month, while patients with other kidney issues may only meet with their nephrologist every one to three months. As nephrology is categorized as a specialization within internal medicine, a nephrologist’s education begins with internal medicine and then delves into more training to treat patients with various kidney diseases. Before someone can study nephrology, they must graduate from an approved medical school, complete a three-year internal medicine residency and pass the American Board of Internal Medicine (ABIM) certification exam. Once the physician has passed the ABIM exam and been accepted into a nephrology program, he or she must then complete a two to three year nephrology fellowship, which must be accredited by the Accreditation Council for Graduate Medical Education (ACGME).